The global mean temperature is not constant – it varies over many timescales. Over the last 150 years the temperature of our planet has been increasing. The graph below shows (in red) the mean sea surface temperature over the North Atlantic since 1870. The data comes from the HadISST data set, produced by the Met Office Hadley Centre. A timeline of the kings and queens of Britain is shown along the top – leaving out Edward VIII who was king for less than a year between George V and George VI. 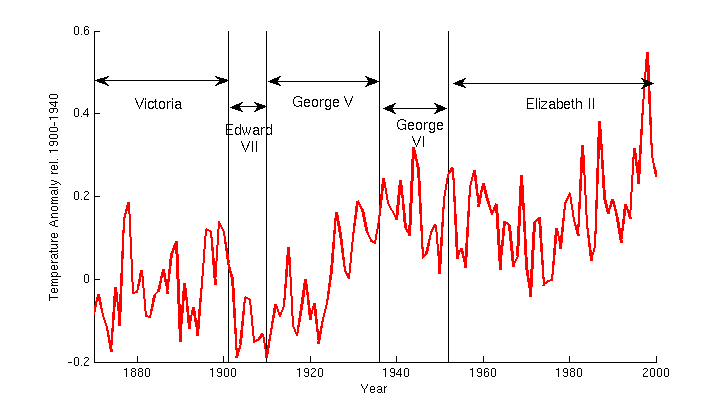 So Edward VII had the coldest reign, George V led to warming, George VI managed to maintain these temperatures then Elizabeth II has turned up the heating in the second half of her reign. The causes of these changes are not fully understood. Edward VII’s cooling is thought to be due to volcanic eruptions – such as the eruption of Santa Maria in 1902. Elizabeth II’s warming is though to be due to anthropogenic causes, although some contribution from internal variability has also been suggested. George V’s warming is least understood – the Intergovernmental Panel on Climate Change (IPCC) state it is very likely due to natural causes, likely some contribution from manmade causes and possible that internal variability is also involved. Global average temperature has increased over the last 150 years, leading to widespread ice melt and rising global average sea level. The increase has not been at a constant rate – the Intergovernmental Panel on Climate Change identified two periods of accelerated warming, 1910 to 1945 and 1976 to 2000. The earlier warming is poorly understood. Climate scientists disagree over causes suggesting solar activity, volcanic eruptions, and manmade emissions. The later warming has been attributed to anthropogenic causes, though scientists disagree over the proportion contributed by internal variability. I am studying the earlier warming in the North Atlantic. Analysing historical observations I have found atmospheric circulation changes may be a key mechanism behind the warming. Using climate models I can test which processes could have been involved. Climate models are numerical representations of the climate system. They allow specific processes to be studied and can provide data where observations are not available, such as 3D ocean properties. Initial investigations have found large changes in ocean heat transport at the time of the warming. Understanding the roles of atmospheric circulation and ocean heat transport will help us separate mankind’s influence on climate from natural processes, allowing better estimations of future climate change.